Welcome to Bayside Sunsets! 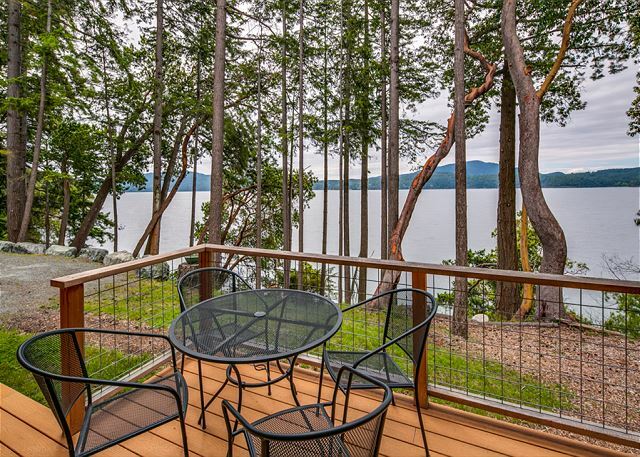 This property is waterfront and features expansive views of the water through beautiful Madrona trees. 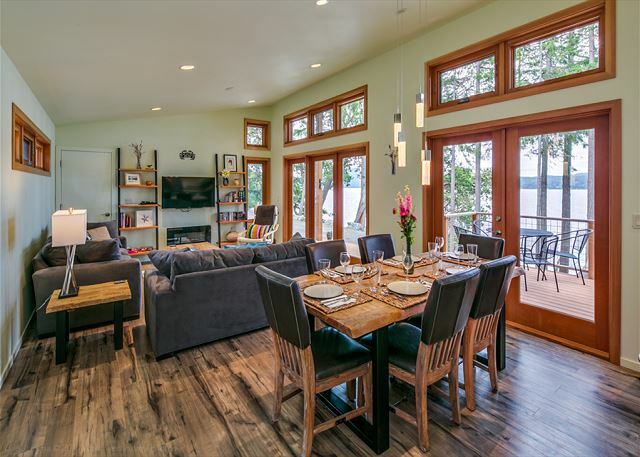 Recently constructed, this home has windows that span the length of the home and face west over the water. 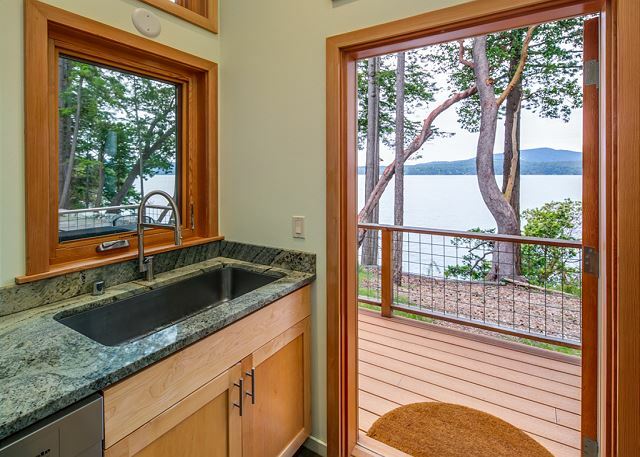 From the home looking left the madrona trees hang over the water's edge. 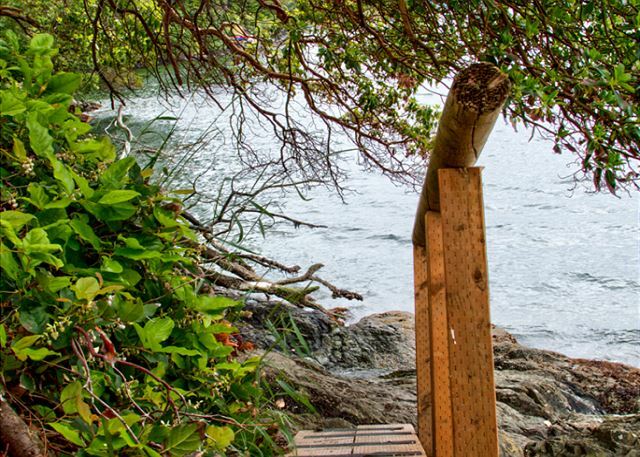 A small ramp leads down to the water's edge. A dining table with six chairs next to the kitchen is an ideal spot to enjoy your meals. Another view of the living room, dining room, and kitchen at the far end of the main living area. The deck outside is easily accessible from either the living room or the kitchen (separate door). 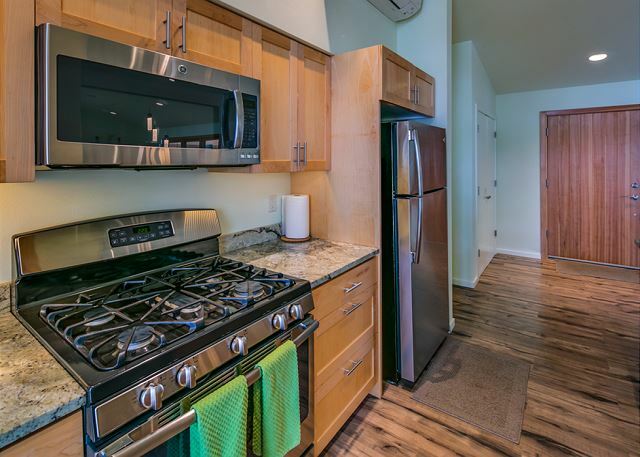 A view of the stainless steel stove, microwave and refrigerator. Another view of the master bedroom and entrance to the ensuite bathroom. A comfortable queen bed is in the guest bedroom. Everything in this house is tastefully done and makes great use of space. 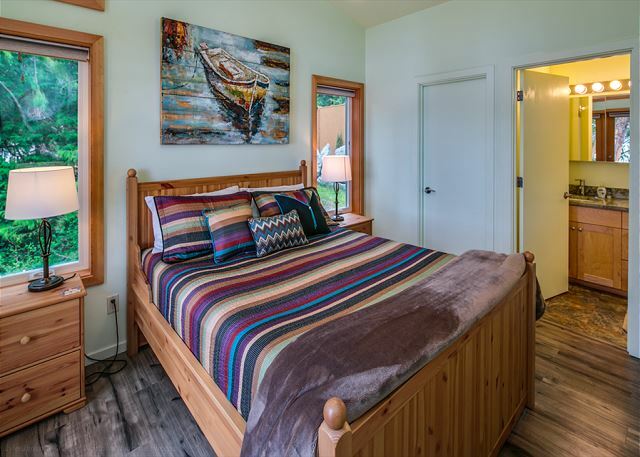 The guest bedroom also has beautiful water views. The third bedroom is farther down the main hallway. 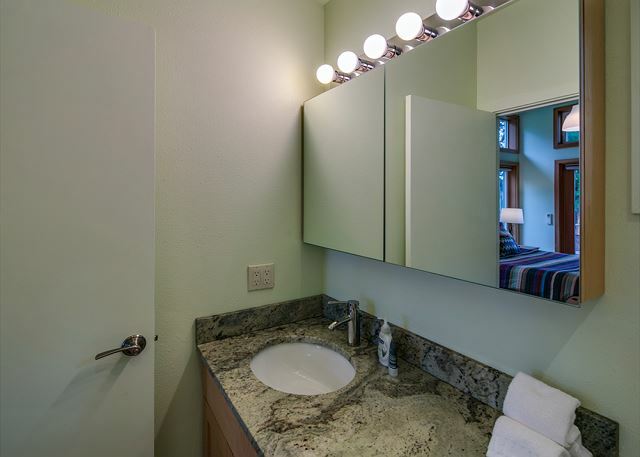 The second bathroom is located off the hall and is easily accessible. 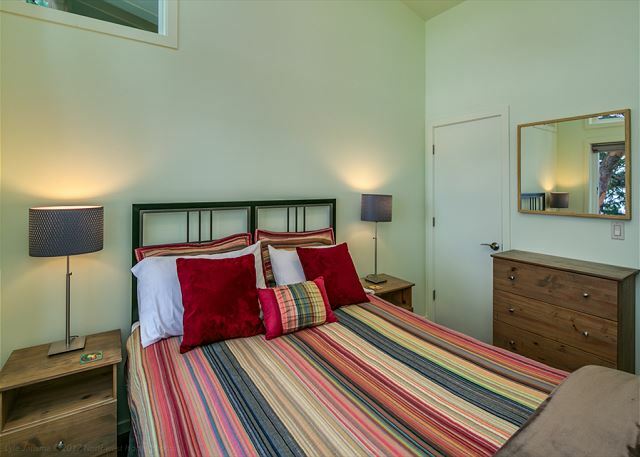 The third bedroom features side-by-side twin beds. The outdoor deck provides a great spot to enjoy an afternoon lunch. When evening settles in, fire up the BBQ and make a pitcher of margaritas. Hey honey did you bring the Jimmy Buffett?! The laundry room is located at the end of the hall for easy access. View of the parking/turnaround area. View of the formal visitor entry. You may choose to enter here or from the waterside up the deck. 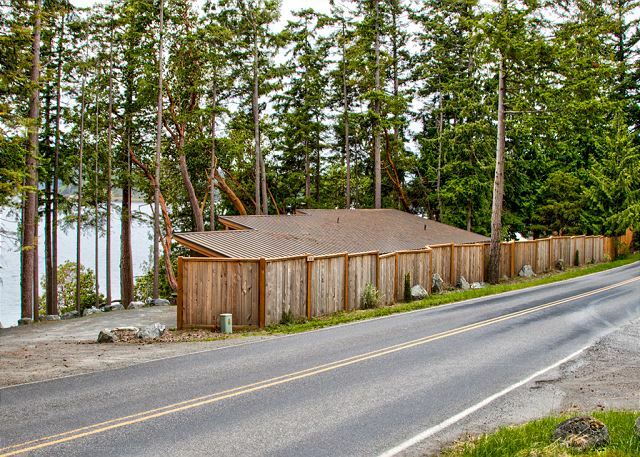 A cedar fence along the road creates privacy. Looking south at the water's edge. 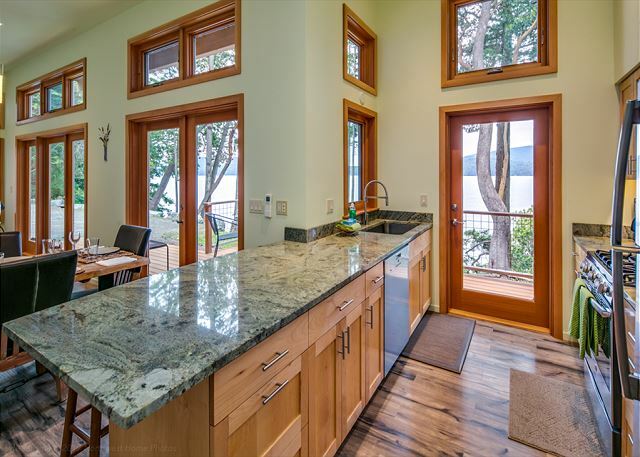 New for 2016, this never-been-lived-in home is clean, beautiful, and close to the amenities of the island. Located five minutes outside the Village of Eastsound, and about 20 minutes from the ferry, guests will relish the views from this bluff above Ship Bay. A single level home, the design is both bright and modern. Windows and French doors line the Western side of the house, allowing guests to enjoy the spectacular view from all of the bedrooms and communal areas. Of course the view is better appreciated from the porch that stretches along the house, providing outdoor seating and barbecuing options. The living room is intimate yet open, with cushy couches, a flat screen TV, and electric fireplace. The dining table is a stylish wood and metal design and allows seating for six house guests with additional padded folding chairs available that can be added to the table. On the other side of the table is a gorgeous granite counter top and a few stools for informal dining. All of the kitchen appliances are brand new stainless steel, as is the sink. 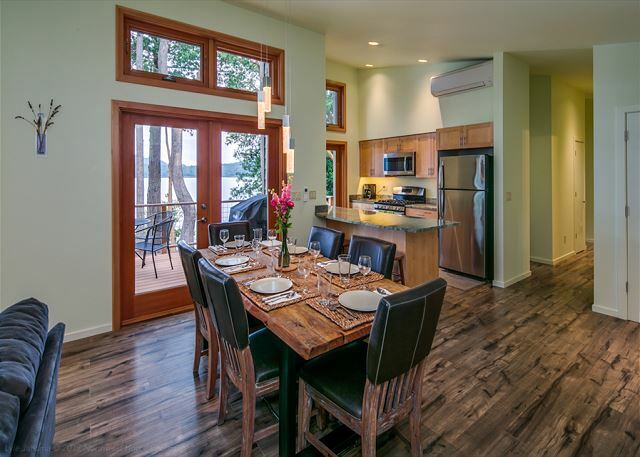 While not overly spacious, this kitchen has all the necessities and plenty of room to cook. Past the kitchen is a hallway where guests will find sleeping accommodations. The first bedroom contains two twin beds with reading lights mounted over each, while the second bedroom houses a single queen bed. 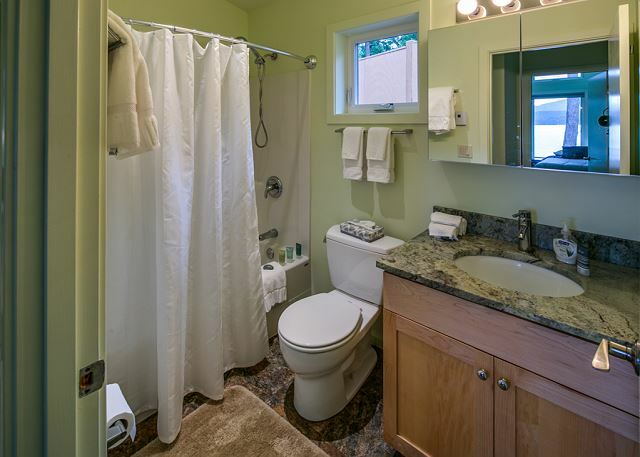 These two rooms both have large windows facing the bay and share the guest bathroom across the hallway, with a shower/tub enclosure. 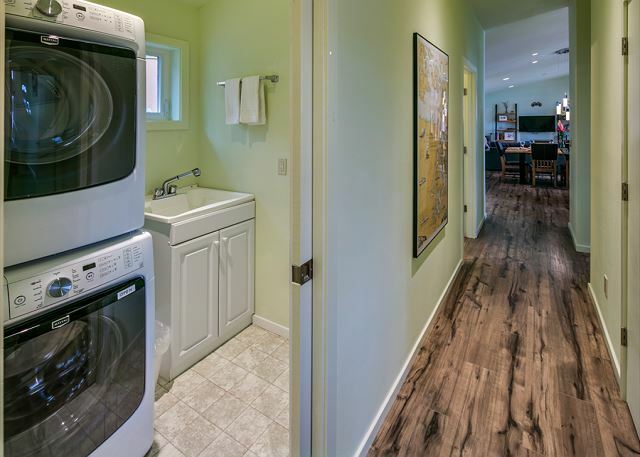 A pocket door in the hallway hides a small laundry room with stackable washer/dryer units and a small utility sink. 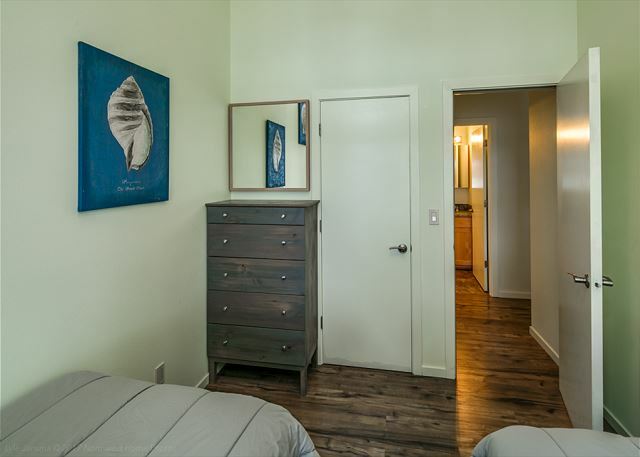 At the end of the hallway is where the master bedroom is located, with en-suite bathroom. A bonus feature here are the French doors off the waterside of the bedroom that lead onto a small, private deck. In addition there is a queen sleeper sofa with inflatable mattress top in the living room. This adds another two sleeping spots for your group. Please Note: There is a well manicured trail that leads to benches. However, because this path runs along the top area of the bluff, this trail may not be suitable for small children. 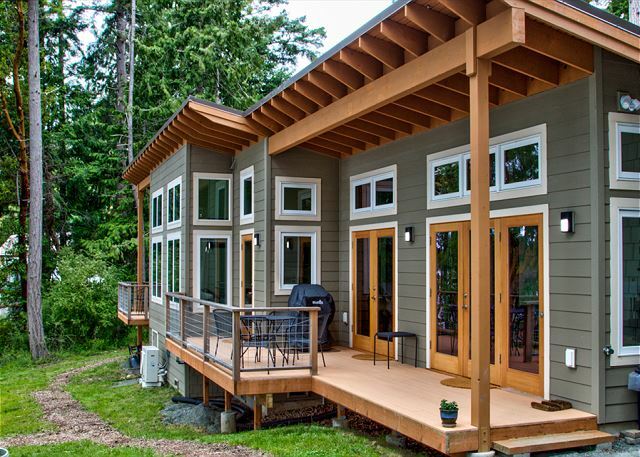 We loved staying in this home on Orcas. There were a number of us and people came and went through the week- it was a great hub to cook in and play games and relax. We took the trail down to the water in the evenings and watched the sun go down. It is really close to Eastsound and on the way to Doe Bay and Mt Constitution. Comfortable beds, really pretty interiors and every room has that fabulous view. Loved it! We thoroughly enjoyed our stay in Bayside Sunsets VRBO. The home was clean, nicely furnished, and the perfect size for the 4 of us. The view from the deck and all rooms of the house is so beautiful that it's difficult to put into words. We saw a doe and a fawn one morning as we were sipping coffee on the front deck. Convenient in terms of getting to Eastsound quickly. Traffic noise is not an issue; muted, if anything. No complaints whatsoever! We absolutely loved this house. The views are incredibe. The pictures don't fully capture it. We had deer, a mink and a bald eagle visit us! 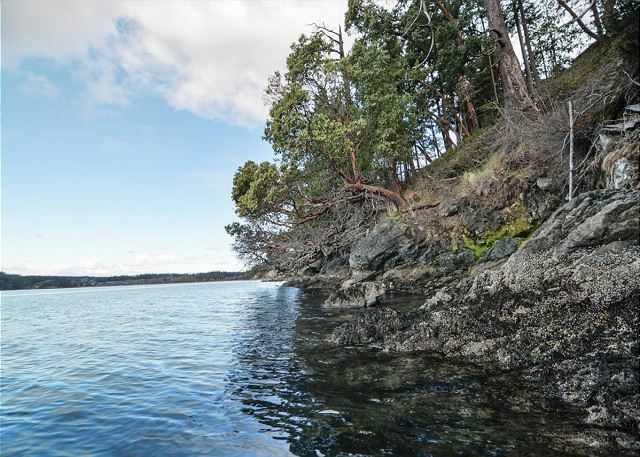 The location was perfect with less than 2 miles to East Sound and so close to Moran State Park. The house was beautifully decorated and comfortable. It had everything we needed except a baking dish but we improvised! 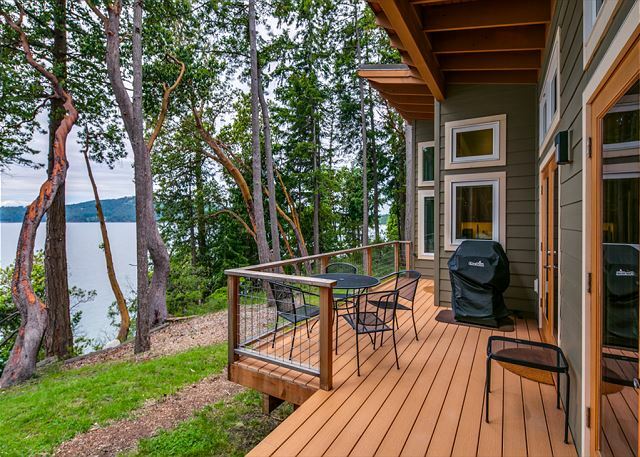 I would stay here any time I visit Orcas Island. Thank you! My family of 5 had an amazing stay at Bayside Sunsets! The name says it all as the sunsets are a highlight. With 3 kids our life is always on the go and this vacation allowed us to disconnect from the hustle and bustle and enjoy each other. We have stayed at many rental homes and this is the first 1 that we did not have to purchase everything from the ground up to make sure our stay was comfortable. I tend to be a clean freak and feel the need to clean upon arrival at most places and did not feel the need here. Clean, comfortable and great views! They thought of everything and then some! We had such a great time we almost forgot to leave!! Becky was great and helped with returning us some items we left behind in our rush back to the "real world". Top notch staff and amenities! Great house with wonderful views, The house feels brand new and had everything we needed to enjoy our stay and grill outside on the deck. The only downside is the location right off the main road. Though we faced the water, there was some noise from passing cars when the doors and window were open. Otherwise, everything was perfect. Everything was perfect and as we expected. The home was lovely and comfortable for our short weekend visit and was a relaxing place to come "home" to after our island adventures whale watching, kayaking, and hiking. We wish we had more time to enjoy it all. Beautiful and convenient location. Easy and uncomplicated property management. Detailed and helpful care instructions, and check-in and check-out procedures. Would definitely come back! The house was lovely and well appointed. 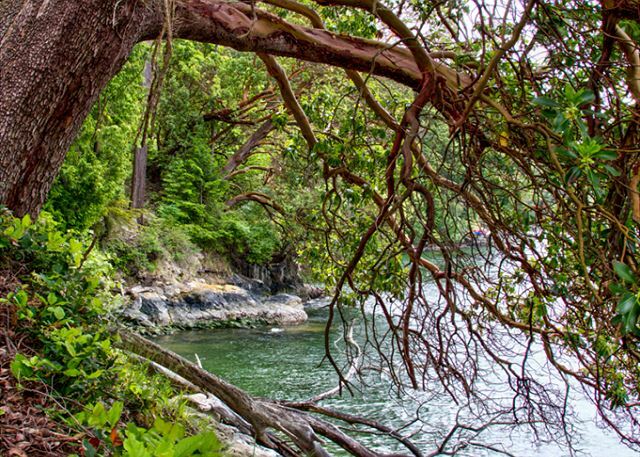 The views of the water, madrona trees and Turtleback Mountain were spectacular. There was some noise from the road at rush hour but only when sitting outside. It was not noticeable inside the house at all. It was wonderful to be so close to Eastsound as well. Gorgeous views, amazing property, perfect weekend! 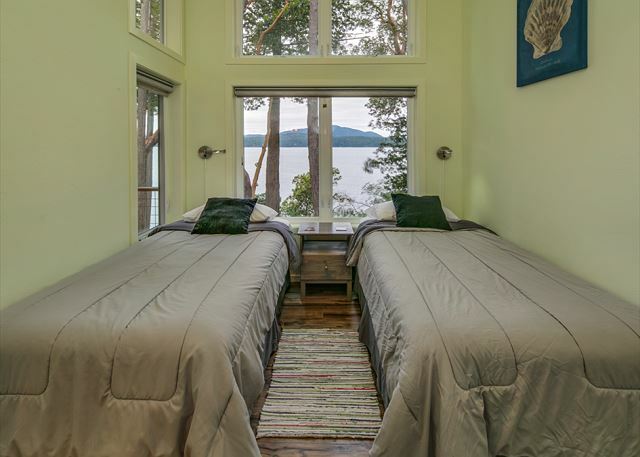 Everything was perfect during our 2 night stay on Orcas Island. The property is amazing! Modern and clean with bay views from EVERY room. Excellent location - Just a couple minutes away from Main Street and close to Moran State Park. Would highly recommend this property. Amazing location, beautiful home. We had a great long weekend. When I was deciding on this property, I could not tell by the pictures if the house was too small. I can say, with experience, that the house is just about right for a family of 4. 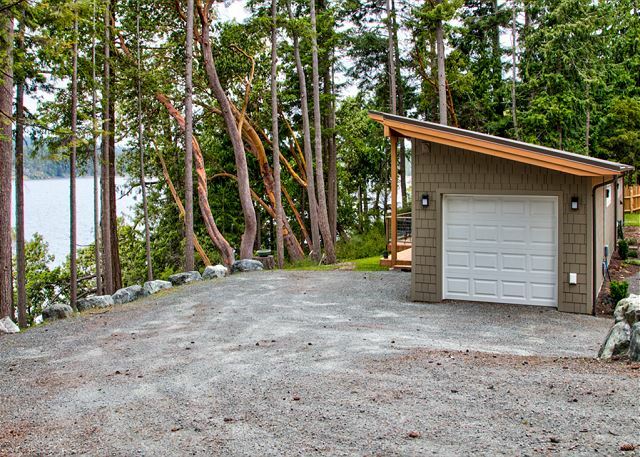 It is built on a small, narrow lot right next to the road. There is a fence between the house and the road, but if you're looking for complete peace and quiet, look elsewhere because you will hear the traffic going up and down the street. Not much traffic at night, but mornings and afternoons have quite a bit. I read it's a relatively new house, and as such, we found the house missing many of the items you might find in more "seasoned" rental. Just an example, we bought some flowers in town, but found there was absolutely nothing in the house to put the flowers in. The basics are there, but for the summer renter, some beach towels, lawn chairs, a cooler, etc., would be a nice and something we shouldn't have to go buy for a week. The kitchen had plenty of plates and dishes, lots of drinking and wine glasses (all the same size), pots and pans and a nice large set of new silverware. In our case, it was missing any paper towels and napkins, and some paper plates would be nice to have. Bathrooms were clean and showers nice with good pressure. The master bath was missing "TP" (except for the 1 cheapo roll supplied). Needless to say, we had to make a stop at the market for paper products. The flat screen TV in the living room worked well. We brought our own streaming box (Amazon Fire TV) and used that to watch movies or stream music. There is no stereo system, and the cable TV is horrible quality. Not sure if HD is just not available or if they decided to save money, but standard channels look bad. The internet service is sketchy. Works sometimes (slow), other times not. AT&T cellular was almost non-existent, and T-Mobile was better but not good. All in all, good clean house with a spectacular view of the water. Recommended. Great location and perfect for a party of 6. Nice layout and wonderful view. We enjoyed our stay, but we would like t see more attention to detail given to this property. Blinking red light on smoke detector and no mirror out at street so you can see to leave the driveway safely. The microwave and the refrigerator didn't work when we arrived.